Hollybeary Creations : TAWS Nov Release Sneaks!! 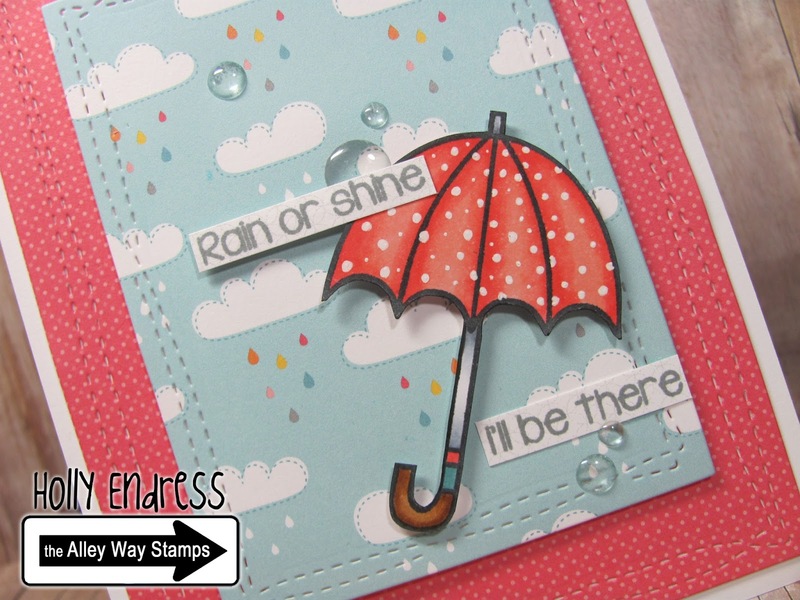 It's time for the November New Release Sneaks from the Alley Way Stamps and today we are starting off with Rain or Shine. I created a White Top folding card base and added a layer of Hello Sunshine pattern paper from Lawn Fawn that's die cut with the Wonky Stitches die from Avery Elle. Then I added a second panel of the same paper using the smaller die in the set. I stamped the umbrella from Rain or Shine onto a piece of White card stock and colored it in with Copics and I added some Polka Dots with a White gel pen. I trimmed it out and adhered it to the panel with dimensionals. I stamped the sentiment in some Hippo ink from Lawn Fawn and added it to each side of the umbrella. For a bit of shine I added some clear enamel dots too look like water drops. Head over to the Alley Way Stamps blog to see more great projects using this new set and enter for a chance to win Rain or Shine today!!! This is one of my favorites from the whole release! The paper, the coloring, the water droplets....everything is just perfect. Love it!